In the late 1940s, a group of people in the Parkwood area who desired to have a church in their own community, began to meet and pray and make preparations for beginning a church committed to reaching the lost and ministering to the saved. We know that this initial group included E. C. Haney, Maro (H.M.) Hancock and Neal Graham. For a period of time these families, joined by some others, met in homes to worship and pray. In August of 1949 Parkwood Baptist Church was officially organized and began meeting each week on Walnut Street in a makeshift building (brush arbor) complete with sawdust floors and splintery pews. Rev. Hayden Cartner was called as the first pastor. A permanent brick sanctuary and classrooms were built on Central Drive (then called School Street) in 1952 to replace the old church building. The basement area under the sanctuary housed ten Sunday School rooms and two bathrooms. 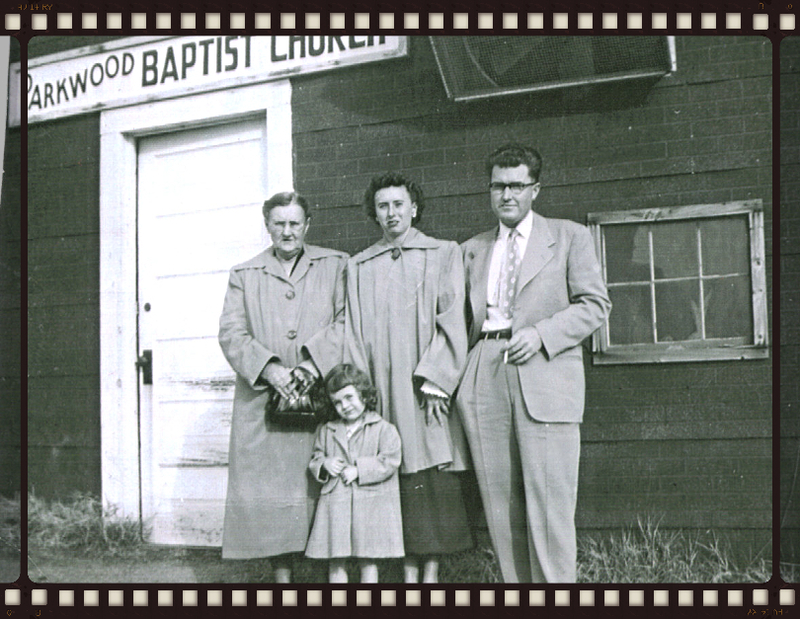 In 1955 the first fellowship hall building (originally a barbecue pit) was built beside the church. Two years later (April 1957) Rev. J. Harvey Clark came to serve as pastor, and a three-bedroom parsonage was built on Parkwood Drive not far from the church. Rev. Clark served as pastor of Parkwood until March 1960 when Rev. William Knight became pastor and remained pastor until June 1962. In 1962 Rev. Curtis Knowles was called as pastor. Under his leadership, the sanctuary was remodeled and in 1965, an educational/classroom unit was added. Rev. Darrell Coble became the church’s Pastor in May 1972, coming from Rome, New York. In 1978 a building project was completed in which a new 40’ x 80’ fellowship hall was built (complete with fireplace), the old fellowship hall kitchen area was enlarged and bathrooms and storage were added. This area has since been remodeled and is now the youth room/hall and adjoining kitchen and storage closet. In 1980 Rev. Gary Bodford came to work alongside Pastor Coble as Part-time Director of Ministries. His wife, Janice, worked as our part-time music director. In 1985, Parkwood began a deaf ministry under the direction of Bo Sherrill, interpreter, assisted by his wife, Glenda. Bo is now an ordained minister and serves as our full-time Pastor to the deaf. Continuous growth of the church led to the building of our current sanctuary in 1989. Also, at this time, the upstairs classroom unit was modified to become the Nursery and Preschool hall. The downstairs classrooms were updated and the Sanctuary was remodeled to serve as the Administrative Offices. In April 1990, the church called Rev. Randy Stone to serve as Associate Pastor; his wife, Tara, worked as our part-time church secretary. They served Parkwood faithfully until August 1994. Parkwood’s Family Ministry Center was opened in 2001 to serve all age groups and functions. This center is used practically 365 days a year and houses a large kitchen, game room, classrooms and a large multi-purpose area that serves as a gym, auditorium or meeting place for large groups of all kinds. Rev. Darrell Coble presented his retirement resignation to Parkwood Baptist Church to be effective the end of December 2007. On December 31, 2007 the Family Ministry Center was renamed the Coble Family Ministry Center in honor of Rev. Darrell and Phyllis Coble and their 35 years of service and ministry to the church and the community. From January 1, 2008 until June 2008 the members of Parkwood were led by a supply pastor, Rev. Wayne Wike for a few months. Rev. Wike was followed by the Rev. Charles Harris, Pastor in the Interim, until November 2009 when Rev. Michael Waters was called to Parkwood as Senior Pastor. In 2011, Parkwood re-carpeted the entire Sanctuary and lobby, 2013 relocated and renovated office, nursery, and children’s wings. In 2013 Parkwood became fully engaged in the Missions Philosophy of Acts 1:8, making an intentional effort to do missions in our Jerusalem, Judea/Samaria and Ends of the Earth with our summer and annual planning. In 2014 Parkwood finished clearing and grading the rest of the wooded property on campus to create additional parking. In 2015 Parkwood moved to a 3 hour Sunday School format offering Sunday School classes for adults at 8:30am, and 9:30am and 11am for all ages and moving worship services to 9:30am and 11am and with these service changes adding a fellowship time for all Sunday groups from 10:30-11:00am. In 2016, Parkwood expanded the welcome center by the sanctuary and added an elevator. The Lord blessed Parkwood Baptist Church in many ways and with many people over the years. Rev. Steve Davis was called in January of 1995 and served as Associate Pastor/Minister to Senior Adults until 2011. Dr. Johnny Presley was called in 2012 to serve as the new associate pastor. Rev. Bo Sherrill continues to serve as our Minister to the Deaf. Rev. John Johnson joined the staff at Parkwood in May 2003 as our Minister to Youth. In 1996 Mr. Byron O’Daniel became part-time Minister of Music, then full-time in 2005. Rev. Michael Steward was called in June 2010 to serve as Children's Pastor until February 2015. Andrea Puckett was called as Children's Director in March 2016. Parkwood Baptist Church is also blessed to have a wonderful Administrative support team and custodial/maintenance team. Though many of our charter members now worship in their heavenly home, their spirit of desiring to reach the souls that are lost and disciple the ones that are saved lives on. Parkwood will always be indebted to that small group of believers whose faith was big enough to believe that God would honor their prayers for a church in their own community.